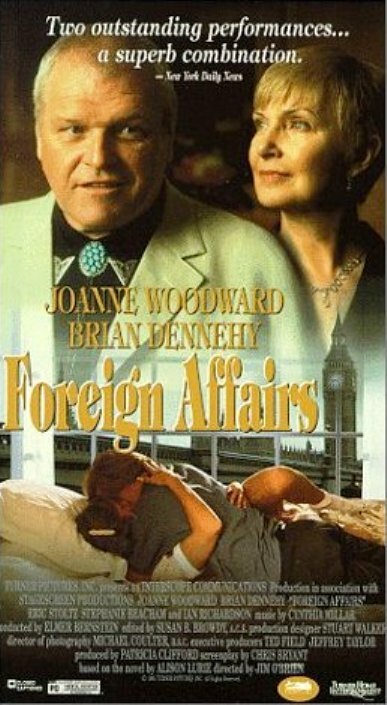 Foreign Affairs is a TV drama written by Chris Bryant (adapted from a novel by Alison Lurie) and directed by Jim O’Brien. 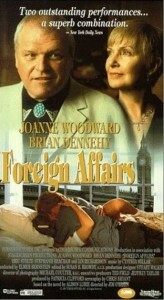 The film was released on VHS in January 1998. It hasn’t been released on DVD. Vinnie Miner, a spinsterish, no-nonsense college teacher from New England, hopes to do plenty of reading on her trans-Atlantic flight to Europe. But Vinnie spends the entire nine hours trying to politely evade the talkative Chuck Mumpson’s non-stop chit-chat. When they finally land in London, Vinnie goes her own way to begin an extended research project at Oxford Library and Chuck just goes away… or so she hopes. But to Vinnie’s disbelief and distress, Chuck seems to show up wherever she goes. Their mutual acquaintance with Rosemary Radley, a volatile actress who plungles into a steamy affair with Vinnie’s young colleague Fred Turner, leads to a series of chance meetings. Their well-meaning friends even attempt to be match-makers, but Chuck is the last person in the world Vinnie wants to get involved with. Traveling, however, can be full of romantic surprises!